Objectives: Investigation of effects of lysozyme (glycoside hydrolase) on Ehrlich ascites carcinoma cells. Studies of influence of these effects on the physiological fate of cells. In particular investigations of possible apoptosis inducing effects of the enzyme by annexin V binding assay. Materials and Methods: Annexin V binding assay was applied for the detection of changes in plasma membrane of Ehrlich carcinoma cells as a result of lysozyme action. In particular, FITC-Annexin V and silver nanoparticles-Annexin V conjugates were used for the detection of these changes. Results: It was demonstrated that as a result of the enzyme action Ehrlich carcinoma cells acquire annexin V binding ability. It means that drastic changes in plasma membranes take place that can be the hallmark of apoptosis. 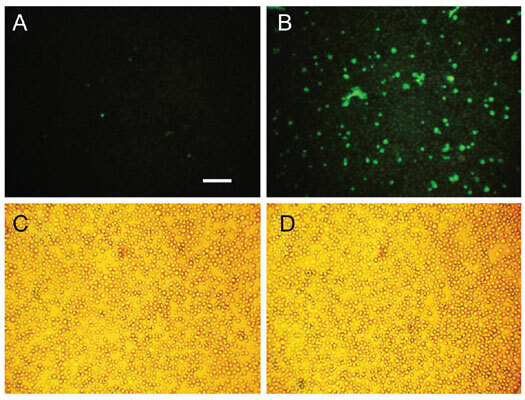 Further, we have developed a new approach for annexin V binding assay by application of anisotropic silver nanoparticles sensitized with annexin V.
Conclusion: It is shown that lysozyme brings drastic changes in plasma membrane of Ehrlich carcinoma cells. As a result of its action, these cells acquire annexin V binding ability - hallmark of early stage of apoptosis. For the first time silver nanoparticles sensitized with annexin V were applied to study membrane dynamics. Lysozyme effects, annexin V binding assay, apoptosis, Ehrlich carcinoma, carcinogenesis, apoptosis.